The Euro is a One-piece, wrap-around apron with an opening in the back and a stretch Hook & Loop closure. 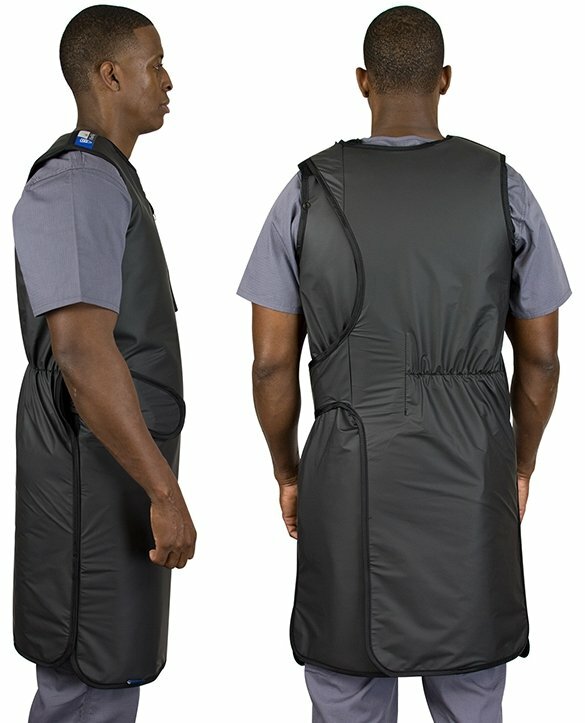 This apron distributes weight from shoulders to hips with no need for overlap making the apron lighter in weight. 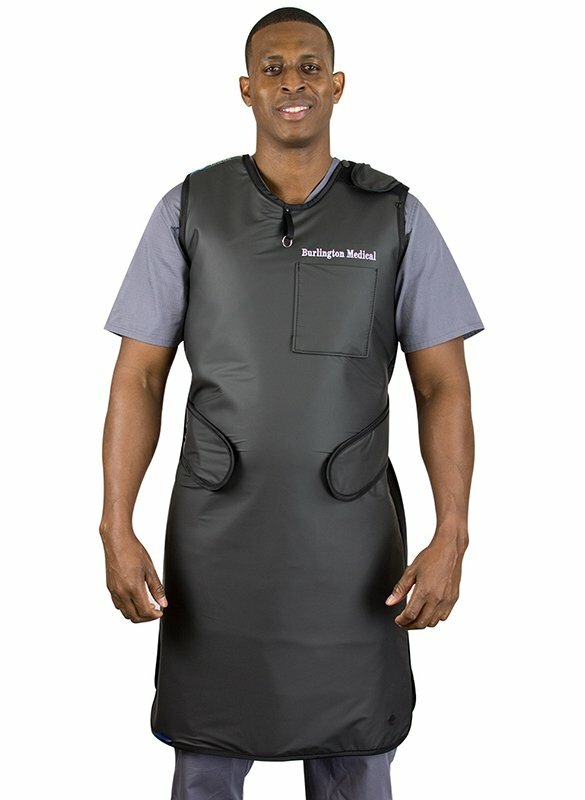 One-piece, wrap-around apron with opening in back and stretch Velcro closure. Distributes weight from shoulders to hips with no need for overlap making the lead apron lighter in weight. 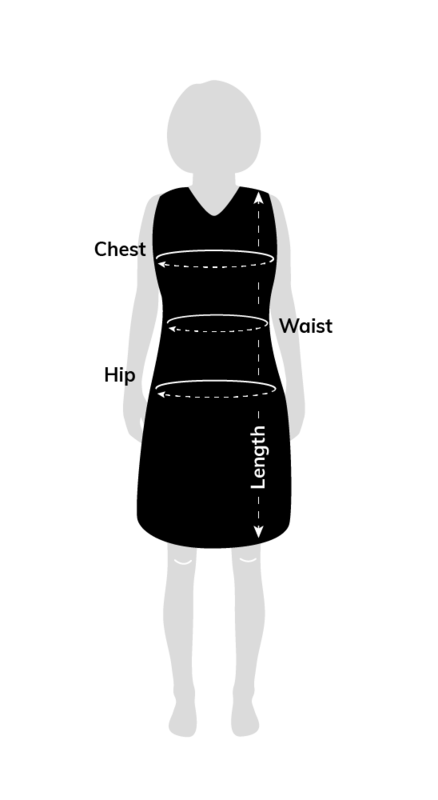 Length- Measure from the top of the shoulder to top of the knee. Chest- Measure around the fullest part. Waist- Measure around the narrowest part. Hip- Measure around the fullest part of the hip. Euro Best for chests measuring smaller than 52” and chest and waists with a difference of 10” or less. PVK Best for chests measuring smaller than 52” and chest and waists with a difference of 10” or less. Overall Weight - This is the overall, or "true" weight of the apron. Based on coverage and overlap of the lead material in the apron. Weight Distribution - This is the weight perception for the apron, or how heavy it actually "feels". The level of back support and weight distribution effect this measure. Wearability - This is the measure of how easy the apron will be to put on. Easier aprons have less buckles and straps, difficult aprons may require a small amount of dexterity to put on. Versatility - This is the ability of the apron to fit multiple body types. A high score denotes that the apron model will not have any problem fitting diverse body types. A high score also means the apron is ideal for shared use environments. Represent your favorite superhero or sports team with our custom designed specialty aprons. We will work with you to create a design you’ll be proud of. To get started contact your account manager or call (800) 221-3466. Our lead free protective material. With only less than 1% variance in attenuation than lead, it makes up for this by being one of our lightest materials. If you are looking for a lightweight material that is 100% lead free, Envirolite is the best option. Our lead composite material made from Antimony and Lead. It provides a light weight, as well as strong protective qualities. All material tested with methods that adhere to ASTM 2547-06(2013) & IEC 61331-1:2014 and meet all requirements. This product can expose you to chemicals including Lead, which is known to the State of California to cause cancer and birth defects or other reproductive harm. For more information go to P65Warnings. Burlington Medical is here to Perform. Guide. Innovate. 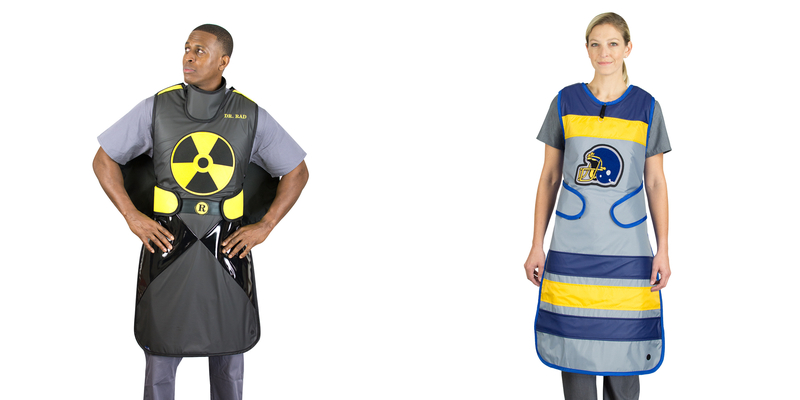 Burlington Medical delivers innovative and superior-quality radiation protection products, services and solutions for hospitals, doctor’s offices, and labs. We promise uncompromising devotion to your medical protection needs. Interested in learning about new products and services to help you do your job better? Copyright ©1977-2019 Burlington Medical. All Rights Reserved. / Website Design & Development by Red Chalk Studios, Inc.